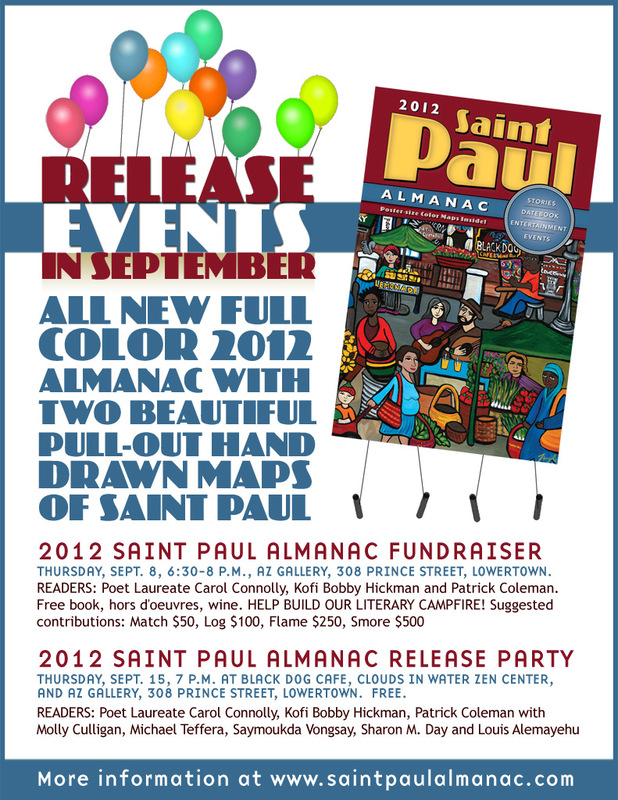 Thursday, Sept. 8, 6:30-8 p.m., AZ Gallery, 308 Prince Street, Lowertown. Readers: Poet Laureate Carol Connolly, Nimo Farah, Kofi Bobby Hickman and Patrick Coleman. Free book, hors d’oeuvres, wine. Help build our literary campfire! Suggested contributions: Match $50, Log $100, Flame $250, Smore $500. RSVP via Facebook. Thursday, Sept. 15, 7 p.m. at Black Dog Cafe, Clouds in Water Zen Center, and AZ Gallery, 308 Prince Street, Lowertown. Free. Readers: Poet Laureate Carol Connolly, Kofi Bobby Hickman, Patrick Coleman with Molly Culligan, Michael Teffera, Saymoukda Vongsa, Sharon M. Day, and Louis Alemayehu. RSVP via Facebook.